Surface observations are usually the first place we go when trying to find mismatches between observed weather and NWP output. We'll talk in this lesson about appropriate methods for making those comparisons and build to a point where we will focus on bigger picture atmospheric processes. 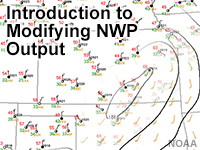 This is the first in a series of video lessons that introduces three different methods for modifying NWP output to add human value to forecasts. Assess relevant NWP output compared to surface observations.